In late summer, we traveled to a remote part of Michigan to spend a long weekend with my parents in the woods. In a rented a cottage on a lake, we were eager to relax together as a family and to spend time in God’s creation. I had not been so far north in Michigan since I was a young girl, and my memories were blurry. I remember loving family time in the Michigan woods, and I was eager to echo that experience with my own children. I wanted to visit the waterfalls in which I had waded as a child and let my children experience the same delight. 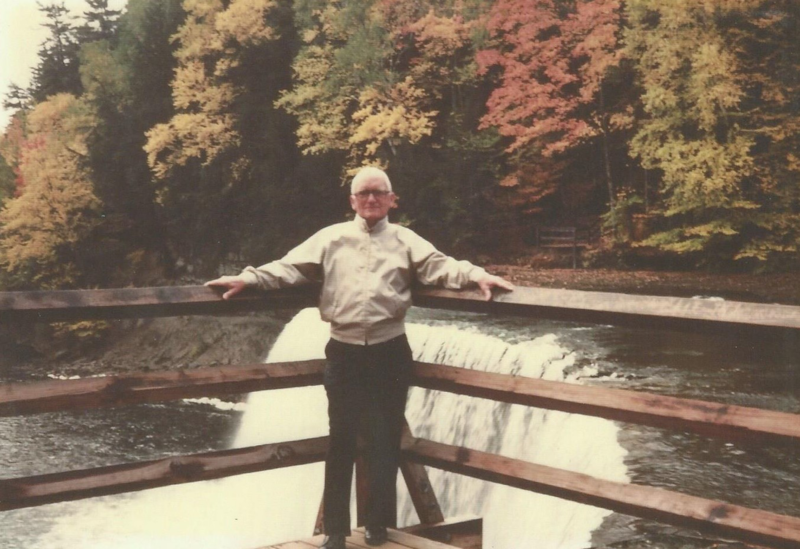 As we visited Tahquamenon Falls, I also realized that the last photograph taken of my grandfather before his death was taken here. He was standing in his tan windbreaker, smiling with his arms outstretched along the wood fence, with the upper falls cascading behind him. Fall colors brightly gleam on the leaves of the far shore. I knew him only through the eyes of childhood, as a kind and gentle man who loved his family. In his last photo, he is forever at peace delighting in the beauty of God’s creation. A month later, a heart attack took my grandfather and left a hole in our lives. This photo persists as a moment of peace and delight, as well as a reminder that life is short and unpredictable. The photo, and even the whole area, is bittersweet with memory. When we hiked down the 93 stairs to the same spot where that last photo was taken, I took my father’s picture, standing where his father stood. I took another with his arms around my children. How blessed I am to have had all these years with my dad that he did not get to have with his. My grandfather died when I was ten, but my children, now as young adults, are fortunate to know and love their grandparents. We were blessed to have this weekend vacation to relax in the woods, roast marshmallows, and see sunsets. These events are worth making time for as we never know what photo will be our last. There were moments over the weekend when my grandparents felt deeply present as I remembered times together at their rented lake house. I remembered watching the sun set together on the porch, or washing dishes together in the antiquated cabin sink, laughing together across the generations. The smell of pine trees and the charcoal cooking dinner are all echoes of time spent enjoying life together. I envisioned my grandparents in heaven looking on with delight to see us together as family still enjoying God’s world. It is okay to shed a tear or more over the losses that we have suffered. It is okay to feel the hurt that accompanies losing those we love. As Christians, we do not grieve as those without hope, but we still grieve. Even Jesus wept for the heartache that he saw. As God stirs these memories within us we are reminded of the gift that God gave us in relationships, no matter how fleeting, theses times are treasures to us. The absence of those we have loved leaves a hole in our lives to which God alone can bring healing. Our role is to acknowledge the hurt and allow God to bring his comfort. I can’t change how young my grandpa died. I can’t determine when I or those around me are going to face loss. The choice I have each day involves where I choose to dwell. I can live in fear for tomorrow or in regret for the past, but both of those options rob me of the joy of today. The best option I have is to trust that God cares about the pain of my past and the challenges of my future. This caring God is worth delighting in today. The love we share among us is worth celebrating today. Now is when we make memories for our future. Jesus tells us in John 16:22, “So also you have sorrow now, but I will see you again, and your hearts will rejoice, and no one will take your joy from you.” We grieve for these moments, but in Christ we can have joy. Each day is a gift from the hand of God and within it there are joys to be discovered. We delight in these days even as we anticipate the day when Christ comes to wipe away every tear from our eyes.